Marinate venison with garlic, ginger, chilli and sesame oil for 15 minutes. Bring barbecue plate to a high heat. Sear venison pieces quickly on both sides in a little oil. Remove and set aside. Clean frying pan, heat some oil and add spring onions. When half cooked, add bean sprouts and mushrooms. 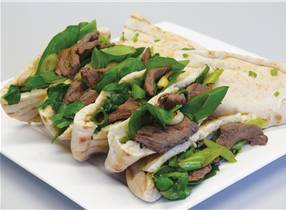 Return rested venison and cooking juices, toss together and add rocket and baby spinach, toss again. Fill halved pita bread pockets, sprinkle with freshly chopped coriander and a squeeze of lime.